Are you looking for a movie with a deeply complex plot that may affect the very way you think? Are you possibly looking for a movie in which the main conflict at hand is resolved with none other than witty banter and or inspirational lines of dialogue? If you were looking for either one of those, you’re very likely in the wrong place. Escape Plan reunites a couple of well known actors whose movies were known to smack audiences with suitcases full of testosterone. I’m talking about none other than Arnold Schwarzenegger and Sylvester Stallone. Admit it, you just grew chest hair thinking about their movies from the 80’s. Now, on to the film at hand. 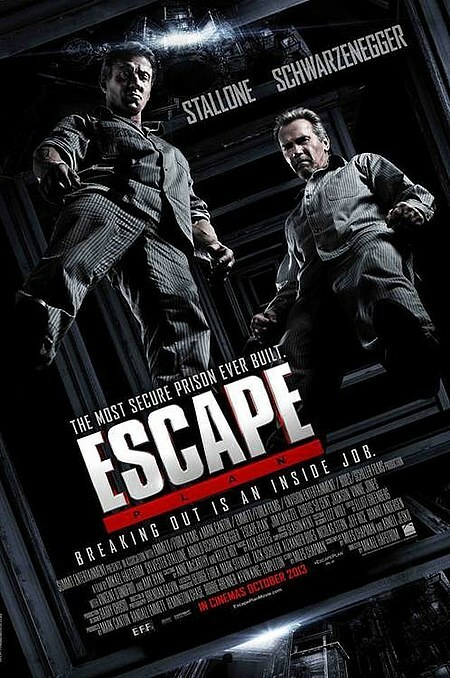 Escape Plan focuses mainly on Ray Breslin (Stallone), a man who works for a security firm that specializes in evaluating the integrity of maximum security prisons. In essence, it is Breslin’s job to break out of prisons and point out their very flaws. Yeah, I know, it’s your dream job too. Breslin co-owns the firm, Breslin-Clark, with none other than Lester Clark (Vincent D’Onofrio) joined by a street-smart hacker (Curtis ’50 Cent’ Jackson), and fellow worker, Abigal Ross (Amy Ryan). Upon the recent breakout of a seemingly inescapable prison, CIA agent Jessica Miller (Caitriona Balfe) offers a multi-million dollar deal to break out of the prison of all prisons. Naturally, Breslin accepts and is given a cover story for the prisoner he is portraying as well as a code word which would be used in the event that escape seems futile. The setup for the meeting and or placing goes wry, and Breslin wakes up in a prison unlike anything he has ever seen before. He learns very quickly that the warden, Willard Hobbs (Jim Caviezel) knows nothing of the arrangement of him being a pseudo prisoner, and proceeds to treat him like an actual inmate. Actually, most inmates in prisoners probably have it better than one’s under Hobbs’ watch. Breslin encounters another inmate, Emil Rottmayer (Schwarzenegger) who seems very interested in Breslin’s situation. Together, they plot to, well …. I know the suspense is killing you…. escape. In the beginning of the film, it felt like the script was so-so, and didn’t seem to engage at first. As previously stated, we’re not looking for deep, profound dialogue here, but some of it seemed to be hit-or-miss. It seems the movie became more enjoyable when Schwarzenegger’s character interacted with Stallone of course. Let’s be real here, that is why people are planning to see this movie is it not? In fact, I’d actually say Arnold’s character was my favorite because of having some of the funnier lines, and actions in tandem with being the badass that he’s always been known to be. Admittedly, some of the planning for the escape was clever, and it didn’t necessarily warrant a eye rolling reaction. Implausible on some levels? Yeah. Completely impossible? If any escapist experts care to weigh in on this upon seeing the film, it’d be welcomed, but some of it isn’t too crazy. Caviezel’s Hobbs was certainly a convincing antagonist that had no reservations on making people suffer to achieve any kind of goal, but, the character won’t likely go down in the history books of memorable cinema villains. As for 50 cent’s character of Hush, it seemed to fit the archetype of the hacker character in fiction with the only real defining feature of him being ‘street’. I use the term defining quite loosely here as his dialogue wasn’t much, and of course the complimentary use of the phrase mother f*****. In context of the film, his character was supposed to sound threatening when saying that, but it incited laughter on my part. Samuel L Jackson syndrome possibly? Are there fist fights? Yes. Is there manly banter? Duh. Is there a ridiculous bodycount? That last one is especially rhetorical. In terms of action movies, it doesn’t necessarily offer anything wholly original. The movie in it of itself relies on the strength of Stallone and Schwarzenegger, as it likely would not cause most movie goers to even bat an eye by comparison to the number of quality titles offered this year. Escape Plan is certainly entertaining, but is it worth your hard earned money at the box office? I can’t say that with full confidence. It’d certainly make a good rental accompanied with friends and alcohol. Upon viewing, you’ll likely forget any “intricacies” of the plot in T-minus 5 days. It’s not the best of Schwarzenegger or Stallone, but it’s certainly NOT Getaway. Escape Plan is a C.
© 2018 Review St. Louis. All rights reserved.